Teresa Martin, the mother of 19-year-old Kenneka Jenkins, talks about the circumstances surrounding her daughter’s death Sept. 10, 2017. Jenkins was found dead in a walk-in freezer at a Rosemont hotel where she had gone for a party with friends and had been missing for a day, her family said. Kenneka Jenkins was discovered after an hourslong search and was pronounced dead at 12:48 a.m. Sunday, according to the Cook County medical examiner’s office. Jenkins’ mother, Tereasa Martin, said police told her Jenkins apparently let herself into the freezer while inebriated and died inside. An autopsy was performed Sunday, said Becky Schlikerman, spokeswoman for the medical examiner’s office, but it wasn’t immediately clear whether foul play was suspected in Jenkins’ death. The cause and manner of the teen’s death were not determined Sunday. Martin said her daughter’s friends called her after 4 a.m. Saturday to say they had lost track of Jenkins in the hotel and left after they were unable to find her. The friends said they were in the car Martin had lent her daughter for the night and they had Jenkins’ cellphone, Martin said. 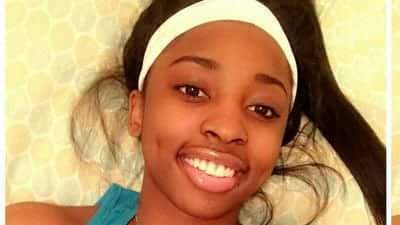 Kenneka Jenkins, 19, was pronouced dead early Sept. 10, 2017 after having been found at the Crowne Plaza hotel in Rosemont. Martin said she headed to the hotel around 5 a.m. Saturday to try to find her daughter. Hotel staff told her they needed a missing persons report from police before they could start reviewing surveillance video of the premises. Martin said she then called the Rosemont Police Department and was told to wait a few hours before filing the report to see if Jenkins turned up. Jenkins’ older sister, Leonore Harris, filed a missing persons report with Rosemont police later that morning, Mack said. Authorities notified the hotel about the missing teen around 1:15 p.m. Saturday. The 11-hour search for Jenkins included all public areas and the ninth floor, where she was last seen by witnesses, Mack said. “The hotel staff and management (were) actively canvassing the area at that time,” Mack said. Martin said around 3 or 4 p.m. Saturday, police viewed some of the hotel video footage and said they did not see Jenkins pictured. The family left and came back a third time around 6 p.m. Saturday, Martin said, at which point relatives started knocking on room doors to see if any guests knew anything. The hotel called the police to complain about the knocking, Martin said. One of those responding officers listened to the family’s plight and agreed to view the video footage again, Martin said. Around 10 p.m. Saturday, police told Jenkins’ relatives they had spotted her on video from about 3:20 a.m. that day, “staggering” drunk near the front desk, according to Martin. Martin said the family members stayed at the hotel until after 1 a.m. Sunday, when police informed them they had discovered Jenkins’ body in the walk-in freezer. It was not clear who located Jenkins’ body, but Mack said the hotel was doing some construction in the area where she was found. Martin said she was told the freezer Jenkins was in was turned on and cold but was not being used to store food. It is not clear whether the construction area was blocked off in any way. Martin said Jenkins told her she was “going to the show and bowling” Friday. Martin said she only learned about the hotel party when Jenkins’ friends called to say they couldn’t find her and were heading back with the car. The friends told her the three were getting set to leave the party but realized Jenkins had left her phone and car keys back in the room. Jenkins stayed in the hallway while the friends said they retrieved her stuff. But when they got back to the hall she was gone, Martin said they told her. Martin also said she had a hard time believing the police account that Jenkins got into the freezer on her own, saying if her daughter was drunk she would have had difficulty opening the heavy freezer doors. Jenkins would have realized the freezer doors weren’t the doors to an elevator or a hotel entrance, Martin said. “Those were double steel doors, she didn’t just pop them open,” Martin said. Martin was angry about what she said was hotel workers’ lack of urgency in the face of her pleas for help finding her daughter Saturday morning, directing her to the police rather than immediately reviewing hotel footage. Daniel Pena, a manager at the hotel, referred questions about the incident to Rosemont police Sunday. “Anyone can understand how a parent can feel distraught over the loss of a child and feel the need to lash out due to the tremendous pain they’re feeling, and we can certainly understand that,” Mack said. “But people can rest assured Rosemont is one of the top, highest trained, most respected police departments in the state of Illinois and does a good job at what they do. Martin said she thought Rosemont police also failed to heed the family’s frantic attempts to figure out what happened to Jenkins. “If they had taken me seriously and checked right away, they could have found my daughter much sooner and she might have been alive,” Martin said.